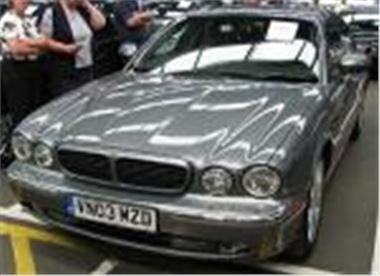 This 41k mile 03 reg Jaguar XJ 4.2 Sport sold for £19,000 at auction today against trade book of £23,875 for a 38k miler. A winner for someone. And there was a much-in-demand 11k mile 04 reg Toyota Yaris Verso T-Spirit auto in the Motability section, gone for £7,100 and hopefully providing a sensible finders fee for the trader who bought it. A 39k mile 03 reg PT Cruiser 2.2 CRD manual went for an even £6,150. Top Car, BMW ex-courtesy cars, Porsche Retail p/x, Black Horse top cars, Fleet & Finance, Inchcape no reserve p/x, Reg Vardy p/x, Lex Vehicle Leasing, Hartwells p/x, Pendragon Group p/x. Ridgeway Group p/x. Light Commercials: Non-Runners, Citroen, Dagenham, Hitachi, Arriva, Northgate, Fleet Direct. Fleet & Finance, LTSB Autolease, Leaseplan, Motability, Lex Vehicle Leasing, Citroen UK, Hitachi Capital, Gowrings of Newbury p/x, Peugeot Charters p/x, Private Direct, Inchcape p/x.